The Summer Learning Program offers summer reading and learning services that prevent summer learning loss during school summer vacation months. As youth track their reading and attend programs, they build skills that maintain or improve proficiency scores in reading, spelling, vocabulary, math and more. As adults read and enjoy library programs, they not only have fun and build skills, but also model good learning behaviors to community children. The program is a blend of academic learning goals, enjoyable hands-on activities, science exploration, the arts, and just-for-fun events! 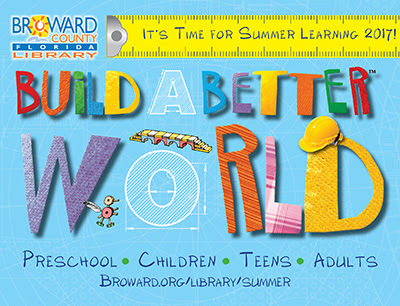 This year, through partnerships with the Broward County Public Schools and Broward Reads, the 2017 Summer Learning Program has expanded its goal to provide community-wide adoption of a single summer learning program that builds seamless summer learning services, and has declared the 2017 Summer Learning Program the primary summer learning program for the county! The 2017 national Build a Better World theme will help families build reading and learning skills. Participant can build knowledge in STEM concepts of science, technology, engineering and mathematical concepts; motivational, character-building events that encourage personal and academic growth; and community-building activities that improve the world through a dedication to world peace and the environment. Youth can earn Brag Tags, fun dog tags to wear on a chain, by meeting their reading goals. All participants may earn free new books and fun prize incentives. All participants that complete at least their first reading goal are eligible for grand prizes. Grand prizes include Duplo sets, tablets, wireless headphones, tickets to local museums and activities, and for our best readers, even round-trip plane tickets! Participants must record their reading and learning online to be eligible for most prizes—ask for help at your local library branch. Register here! The above is an excerpt from the Broward County Library website. For full details, visit their page.